Are you searching for a new Subaru vehicle in Arizona? 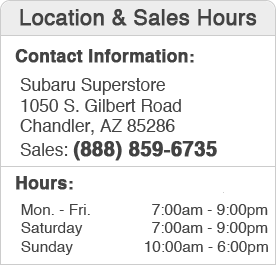 Take a short drive to Subaru Superstore at 1050 S. Gilbert Road, in Chandler, Arizona 85286 for the our new 2012 Subaru's and used cars in the Scottsdale area. We have a huge selection in stock, our inventory of new 2012 Subaru cars including the Impreza, Outback, Legacy, WRX, Forester and more! You will enjoy competitive prices on some of the most popular new cars in Arizona! 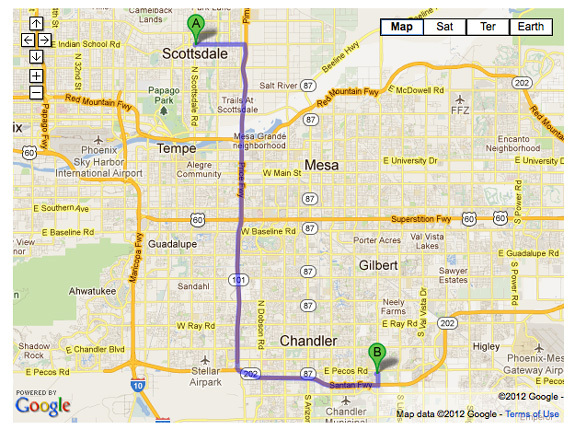 If you are searching for a used car in Scottsdale, Subaru Superstore also has you covered. Browse our online inventory of used cars at anytime. When you find the car or SUV you would like to buy, fill out the form on this webpage or call (888)~859~6735. We will answer any questions you have to help your purchase. Subaru Superstore also offers New and Used Car Financing, Car Repairs, and more. Let Subaru Superstore get you into a new Subaru or used car in the Scottsdale area with a low interest rate on a car loan. Our fantastic financing team will do all the work for you, and will search out the best local and national rates. We will work with your budget and find a new or used car loan that works just for you. We also have a variety of Subaru lease options available for our Scottsdale customers. If you need any type of car repair, body work, or Subaru parts our service department is ready to assist you. Our service department only has certified technicians that use updated techniques for all your maintenance needs. Make Subaru Superstore your first choice dealership in the greater Scottsdale area.